Last week I made dinner for the long suffering Mrs Lowe (@Luce700) - something which is not entirely uncommon. What made this particular occasion noteworthy was that the dinner was good. Really good. And the wine we served with it was simply heavenly. The two together made such a great partnership that I was compelled to put it down in writing, in the vague hope that someone else may, some day, stumble across this blog and share in the joy it brought us. The wine in question was Charles Smith's Kung Fu Girl Riesling (2010). There has been a considerable amount of excitement generated by this wine. Its name certainly attracts attention, but the quality of the liquid is what keeps people talking about it weeks and months later. Charles is a real character, and his wines certainly reflect his personality. The Kung Fu Girl Riesling is a light bodied wine, with a lively acidity, and is bursting with intense tropical fruit flavours. There's apricot, peach, kiwi, pear, melon, green apple, and honeysuckle to name but a few. This intensity of flavour is what made the food pairing work so well. Halve and de-seed the peppers and stick them under the grill for 10 minutes, then leave to cool under some foil (you can cut up and measure out the rest of the ingredients during this time). Peel the peppers when they're cooled, and throw them in the blender with the rest of the ingredients. Blend! These measurements will give you a good amount of salsa, so you can save some (for reference, it will pretty much fill up one of those big Dolmio jars, which makes it easy to store in your fridge. 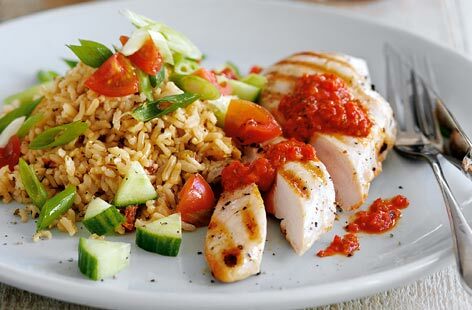 Boil some rice, and serve with some spring onions, cucumber and cherry tomatoes. Once you've made a batch of the salsa, it only take five or six minutes to cook off some chicken to go with it, making this a fantastically convenient dish. It's pretty spicy, which is what makes it work so well with the cool, crisp, tropical flavours of the Kung Fu Girl Riesling.